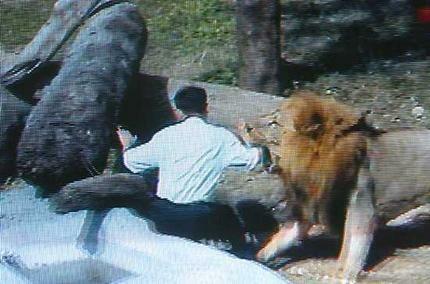 A TV grab shows local resident Chen Chung-ho being attacked by a lion inside a zoo in Taipei. A lion attacked a man who jumped into the animal's enclosure and shouted "Jesus will save you!" at the big cat on Wednesday at a zoo in Taiwan's capital. An eyewitness, Hsu Li-jen, told cable station CTI that the man shouted "Jesus will save you" at the animals. Guards drove the lions away with water hoses and police shot the animals with tranquiliser darts. The man, identified only by his surname, Chen, then picked up his jacket and climbed out of the pen himself. He was taken to the hospital for tests. Another doctor said Chen, 46, had psychological problems. "He took this dangerous action today because he imagined he heard voices," psychiatrist Teng Hui-wen told reporters, saying his case was still being investigated.